Want to turn on a light when motion is detected outside, it's after sunset and you're not home? No problem! Want to unlock the door when you arrive home, but only if there's a leak in your basement? Strange, but you can do it! 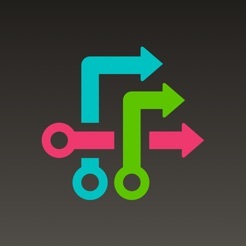 Define a trigger, set some conditions, and specify the actions to take. Your devices are all organized and easy to work with. 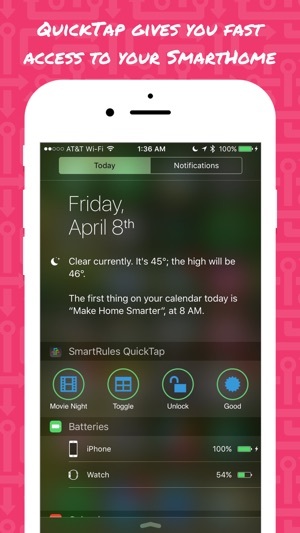 You can also quickly trigger rules with QuickTap. Add SmartRules to your Today Screen, and to your Apple Watch and quickly trigger a rule with a quick tap! 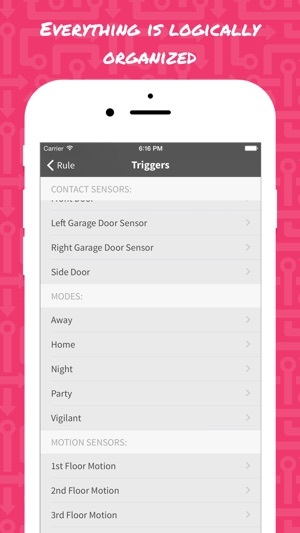 Just add the "QuickTap" trigger to any rule, and it will show up in both of these convenient places. 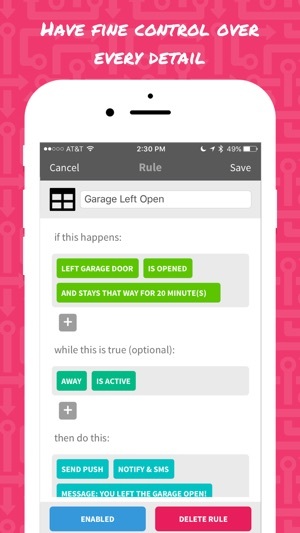 Show SmartThings who's boss with the all new SmartRules app. * SmartThings and SmartApps are trademarks of SmartThings, Inc. Note that SmartRules currently only works with one location. You cannot define rules for multiple locations. Squishing some bugs. This version fixes an issue with sunrise/sunset rules and an annoyance with the height of the Today Screen widget. We have had two automated homes that use rather sophisticated control systems, but when we bought a small office building and desired automation we decided to try out some newer (and less expensive) hardware along with the Smart Things hub. We were almost ready to throw in the towel and go back to the more expensive systems because of the lack of complex rules in Smart Things (e.g., multiple conditions for triggers) when I found Smart Rules. With just a few minutes I was able to set up rules that should allow us to control our HVAC system based on things like humidity sensors (in thermostats) and outside temperature. Assuming it works as promised (and reviews in the Smart Things community suggest it does) this app takes Smart Things from a simple user interface to a product that’s actually useful. It’s what Smart Things SHOULD have been, but has never been. I think SmartRules is for those who want to give a boost to SmartThings functionally in a simple way and couldn’t care less about $10. If you’re okay with a bit less simplicity or do care about $10, you’re better off using Stringify. I don’t believe SmartRules offers anything Stringify doesn’t offer, and Stringify is free. Not to mention the many things Stringify can do that SmartRules cannot. I also don’t appreciate the lack of transparency about the cost. Nowhere in the description is anything about a free version mentioned, and the app doesn’t even have “in-app purchases” noted in the App Store. Two stars for possibly offering something someone can use, but only two stars for the non-transparent high cost for something you can get elsewhere for free. I noticed many of the best reviews for SmartRules are two years old; that’s probably not a coincidence. Kudos to the devs for offering this enhancement to SmartThings, but as sincere feedback, I feel you need to lower the cost and improve the functionality to entice most informed DIYers. My two cents! Hi Bob. I apologize that the purchase was unclear. The App Store should show the in-app purchase for "Unlimited Rules". There is no intention to trick you. The idea is to let you try it out with one rule, to make sure it works for your needs, then allow you to purchase if you like it. We think the cost is very reasonable for the value you will get. The main advantage over Stringify is that there is no third party server here. 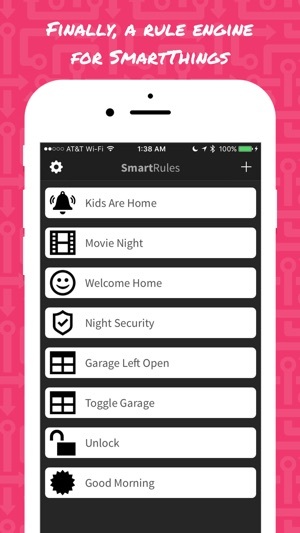 Your rules run directly on the SmartThings infrastructure, just like any other SmartApp. That means there is no additional exposure to failures or security breaches, and there is no possibility of us collecting any data from you, even if we wanted to! It. Just. Works. And it just keeps working. You did it obycode, LLC. You did the thing. You did great. Keep doing great, you’re good at it! Somehow, though, tons of people in this app’s review section are tossing out one-star silver bullets either because of their ignorance or lack of understanding of basic token handshaking methods. Not working? Maybe it’s because of that 443 request to safari which you said no to, and now there is no way of defining your uniqueness criteria. Cmon lassies and laddies, ask support and be patient first before raging and flaming an app with a one star like that.